Macanudo Gold Label cigars employ a specially selected, golden Connecticut Shade wrapper leaf to impart a distinctive creamy taste, blessed with a natural sweetness. Quite possibly Macanudo's smoothest cigar yet, Macanudo Gold presents a maintenance-free smoking experience with unmatched silky finesse. These seasonal smokes are released annually and sell out fast, every time. Macanudo Gold Label Court brings you ultra-smooth Dominican flavor in a convenient 4 1/4 x 36 small cigar. typical Macanudo excellence. best overall quality of cigar tobaccos. 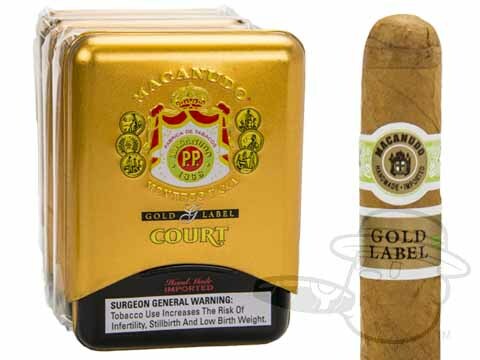 Macanudo Gold Label Court is rated 4.6 out of 5 based on 3 customer ratings.